We update the Railway Technical Website from time to time. While we try to get everything in place correctly, there are bound to be some minor glitches. Please let us know if you find any errors we have missed. Thank you for visiting us. We hope your visit has been interesting and informative. Railway Systems Engineering & Integration MSc Course at the University of Birmingham. Institution of Railway Operators - courses at Certificate, Diploma and Degree level. Is Hydrogen the Answer? a presentation by David Shirres, Editor, Rail Engineer, to the Institution of Mechanical Engineers in Glasgow demystifies and explains the concepts of hydrogen based train power as opposed to diesel power. An article in Rail Engineer, Hydrail Comes of Age, dated 5th January 2018, describes the progress of hydrogen power development for trains. The Railway Technical Website is an information resource with articles about railways around the world, covering technical, operational, maintenance and financial issues. The site is maintained by Dr. Piers Connor of PRC Rail Consulting Ltd.
We have included a wide range of subjects - systems, design, operation, planning, finance, engineering, production and maintenance. Both technical and operation aspects are covered. There's plenty of pictures and graphics and links to other relevant sites. In the articles, we use the UK railway system as the base technology but there are also descriptions and information about other systems around the world. Articles and glossaries are provided for a range of subjects. 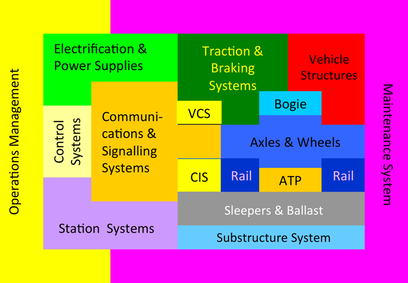 Figure 1: A diagram of the railway as a system, showing how the main subsystems fit together to form the whole. From a diagram by Prof. F. Schmid. A railway is a system. It comprises many parts that fit together to make the system work. If any of the parts fail to operate correctly, the system will quickly stop functioning and the railway’s customers, both freight and passengers, will see a deterioration in the service provided. A railway may be defined as a high value, fixed guidance land transport system, carrying passengers and freight in purpose-built containers, using specifically designed, high power traction systems and controlled by high integrity safety systems. Railways are subject to strictly regulated safety regimes, require reliable long distance communications and specially trained staff meeting defined medical requirements, sometimes working alone in hostile environments. The costs of construction, operation and maintenance of a railway do not normally offer a commercial return on investment and therefore requires substantial government subsidy, thus bringing with it a high degree of intrusive political interference and often malevolent media reporting. The life of railway assets is usually in the range of 20-40 years for electrical and mechanical systems and 60-120 years for fixed civil engineering infrastructure, assuming properly managed and regular maintenance. This life cycle drives a need for a long term approach to the initial system design, to the strategic management of existing systems and to the development of replacement strategies. Although this site is written from the perspective of the UK based railway industry, most of the information is valid for railways internationally. Differences between UK practices and those in other countries are noted from time to time, if relevant. Much of the technology is the same, wherever it is used. What can differ from one system to another is how the technology is used, particularly for signalling and train control, and how the industry is financed and regulated. We welcome feedback and suggestions for new subjects. Please Contact us.